Does spring announce its arrival by the unusual amount of cat hair covering your home? As your kitty trades her heavy winter coat for a light summer one by shedding – a natural and important process — she’s helping to remove any dead fur that causes skin irritation. 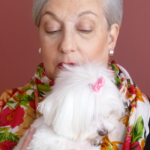 On the other hand, no shedding may be a sign of poor diet or an underlying medical issue, while too much shedding that leads to bald patches or a very thin coat warrants a visit to the vet. Although some breeds shed more — or less — than other breeds, their exposure to daylight also plays a part in “signaling” their bodies when it’s time for a seasonal shed. And so, if your cat spends a great deal of time outside in the sunshine or lying in direct sunlight inside, she may be more prone to shedding as the days grow longer. 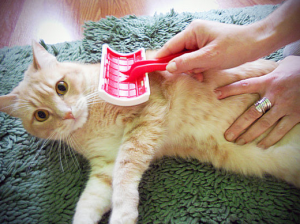 Brushing your cat regularly is the best way to manage any excess hair at the source before it starts wafting through your home in tufts or emanating from kitty herself in the form of hairballs. A good indicator of how often you should brush her is the length and thickness of her coat. If your kitty isn’t used to being brushed or quickly becomes fidgety, it’s important to make the process as stress free as possible for her. Begin with brief sessions and reward her with plenty of praise and high value treats. Once she’s more relaxed, increase the duration of the brushing sessions, and by making it a positive bonding experience between the two of you, she’ll appreciate it even more. Always brush WITH the grain in the natural direction that her fur grows. 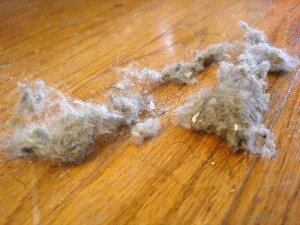 Brushing out knots and mats can be difficult and some may need to be cut out. If your cat is severely matted, it’s advisable to see a groomer or consult your vet before trying to remove the mats yourself. Longhaired cats are best served by starting with a long, stiff shedding rake or comb that reaches down near the skin and dislodges hair from the undercoat while leaving the outer coat almost entirely unaffected. They should then be brushed at least every two days. 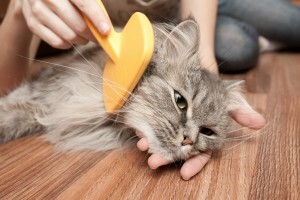 For shorthaired cats, begin with a bristle brush. This loosens some of the hair trapped near the skin that causes irritation. Shorthaired cats with a double coat require less brushing than longhaired cats, while those with a single coat need even less. Whatever the length of your cat’s hair, ending each session with a slicker brush (its smaller bristles are ideal for grabbing the hair dislodged by the brushing) is another way to keep her coat smooth, shiny and sleek. Lint rollers are also an asset, keeping your clothes as hair free as possible when you leave your home while doing the same for anyone entering your home. Consider those around you who might be allergic to cats, and have a lint roller on hand to remove whatever vestiges of your cat’s hair are clinging to you. To keep your environment as hair free as possible, running an air cleaner, particularly one designed to handle pet hair, can help provided you replace the filters regularly. For carpets, some cat owners use a vacuum while others prefer a rubber broom with squeegee bristles. The bristles help clump the hair together in a ball and seem to work better than vacuuming alone. For tiled or wood floors use a damp mop. If your cat has a favorite spot on the furniture, drape it with an easily washed blanket, and if she sleeps in your bed at night, use a duvet cover that you can remove and wash.
Now open your windows and welcome spring!